moForte Guitar is a virtual guitar for iOS devices based on modeling the physics and performance techniques of the guitar. Because moForte Guitar is modeled, rather than based on playing back samples, the performance experience is uniquely expressive and interactive. Modeled feedback and distortion like a real metal guitar. A selection of models for popular types of electric guitars. Powerful authoring tool for chart creation – supports custom chords and effect presets. Modeled guitar articulations including: harmonics, pinch harmonics, slides, palm muting, string scraping, damping and auto-strum. 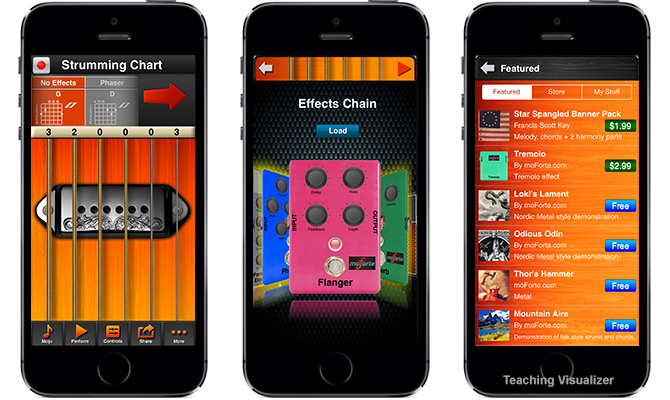 Fully programmable effects chain including: distortion, compression, wah, auto wah, 4-band parametric EQ, phaser, flanger, reverb and amplifier. For iPhone 4s or better and iPad 2 or better.